If I've learned anything from watching Game of Thrones, it's that the Iron Throne is a terrible seat to sit on. It's uncomfortable and dangerous and when you finally start to enjoy it, you'll probably be dead. 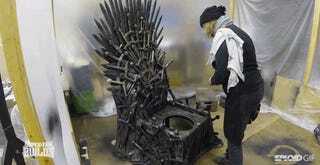 But an Iron Throne toilet? Now that's awesome. You get to feel like the most powerful person in the bathroom. Super Fan Builds outfitted a toilet in the Iron Throne style and it's pretty damn perfect. It'll probably get gross and dirty and nasty but hey, it took a lot of blood and guts and nasty things to make the original Iron Throne too.